If you don’t yet see the Labs setting, it should be rolling out gradually across all Google Calendar users. In conjunction with the rollout of Google Calendar Labs, Google is also opening up new APIs for developers to change the Google Calendar interface. Google Calendar can act as a gadget container complete with hooks into OpenSocial apps and OAuth authentication, or apps can be written as new sidebar features. The new Labs features were written using the gadget API. Maybe someone will write a Google Calendar app like Facebook events which makes it easy to organize and add events to your calendar directly from Gmail, or better yet, Facebook. 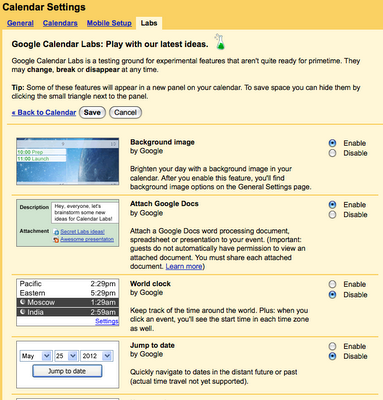 What new features would you like to see come out of Google Calendar Labs?